If you’re a long time iOS user, you’ve probably noticed that there are certain apps that seem to take up a whole bunch of space on your device for no apparent reason. For instance, Instagram and Facebook can balloon way past 500mb each as well as other apps. To check how much space all your apps are taking up, head on over to Settings > General > Usage and you’ll be able to see the total amount of storage you have, how much is available and used, and the amount of space every app is taking up. Now, in the past, the only way to really free up space from apps taking up large amounts of temporary space was to delete the app and reinstall it. This is really time consuming though and honestly there should be an easier way to do it. Instagram for instance has no way to clear its cache and supposedly will do it on its own, eventually, but you never know when that is. That’s where PhoneClean comes into play. 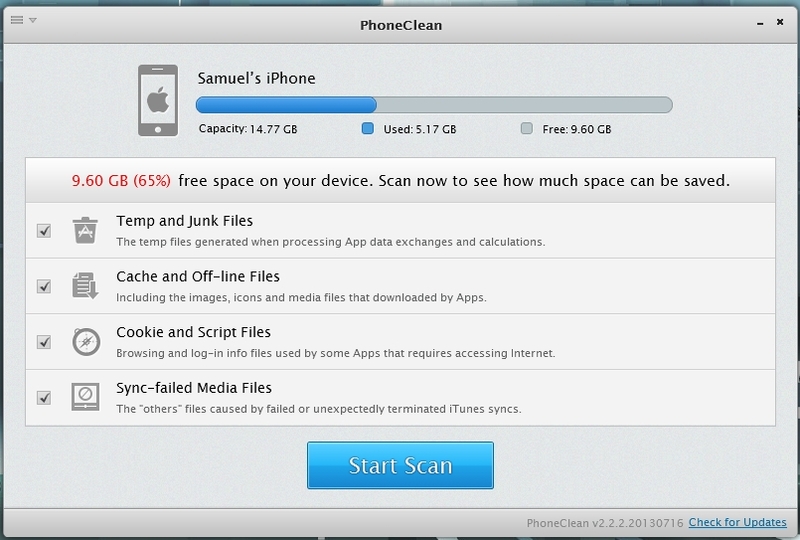 PhoneClean is a PC/Mac app that you install to your computer to use. You must make sure you have the latest version of iTunes as well since you will need to connect your iOS device to your computer via sync cable. Basically all you have to do is plug your device in, have PhoneClean scan your device to see how much space it can free up, and then allow it to clean it for you. You don’t have to clean everything though as you can tap the little arrow that appears after the scan to see which items you might want to keep. Overall, I’ve had lots of success with this app with the most amount of space I’ve freed up being around 1.5gb. Of course I wouldn’t run the app all the time. I’d maybe use it about once a month as I don’t think it’s necessary running it more often than that.